"Today, more than two years later, I have no regrets at all. My decision to seek care at Roswell Park was an all-around, complete win. Of all the treatments I’ve been through, Gamma Knife radiosurgery was the least invasive. " Read our blog on how Roswell Park's Gamma Knife Icon frameless technology made all the difference for one patient. Roswell Park is now treating patients with a brand-new, state-of-the-art Gamma Knife radiosurgery device, the Leksell Gamma Knife® Icon™ — the most advanced technology of its kind on the market. Roswell Park is the first cancer center in the United States to receive a license to operate it and remains the only facility in Western New York with Gamma Knife capabilities. We have used Gamma Knife radiosurgery to treat patients with brain tumors and metastases for 20 years. This latest technology comes with certain advances that mean more patients may qualify as candidates for the treatment, and the ultra-high accuracy minimizes long-term side effects, improving outcomes. Roswell Park's Gamma Knife program has treated nearly 6,300 patients. Gamma Knife radiosurgery isn’t a knife at all, but a type of extremely precise and sharply focused radiation therapy that treats cancer tumors and lesions in the brain. The precision of the tool is “surgical,” but there’s no cutting, no incisions, and no requirement for anesthesia. Patients are awake and go home after the treatment, resuming normal activities. The minimally invasive treatment uses a unique technology that produces 192 intersecting beams of gamma radiation. The individual beams pass through the body without causing damage — preserving healthy brain tissue — until the point where they intersect, destroying cancer cells. 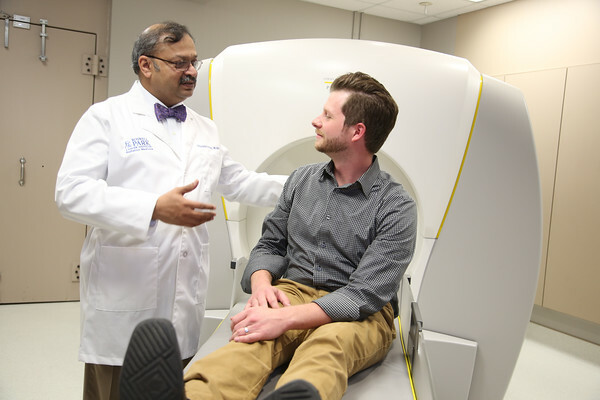 In November 2018, Roswell Park celebrated the 20th anniversary of the Gamma Knife program. In 2017, Roswell Park saw the highest volume in the U.S. for a single Gamma Knife device, treating 540 patients. For more information and statistics, click the image above. Who Can Receive Gamma Knife Treatment? The Leksell Gamma Knife® Icon™ offers new treatment options for patients with inoperable tumors that are close to critical parts of the brain. Better accuracy. Targets larger tumors with accuracy to within .15 mm, compared to other techniques such as Linac Stereotactic Radiosurgery. Real-time dose confirmation. Integrated cone-beam CT imaging and software continuously control radiation dose delivery. If the patient moves out of the target area, treatment automatically stops. Frameless fixation. The new device can accommodate frameless techniques (such as a molded face mask) rather than a frame (rigid metal device affixed to the skull) to hold the patient’s head in position. Fractionated treatment delivery. The frameless method enhances our ability to fractionate treatment across multiple sessions, allowing for a higher and more effective overall maximum dose to be delivered more safely and with fewer side effects — even for larger tumors, and tumors close to critical structures. Maximizes patient comfort options while maintaining the guaranteed accuracy expected from the Gamma Knife, making it the gold standard for cranial radiosurgery. Recurrent tumors of the skull base and head can now be treated with Gamma Knife, offering a new therapeutic approach to patients. 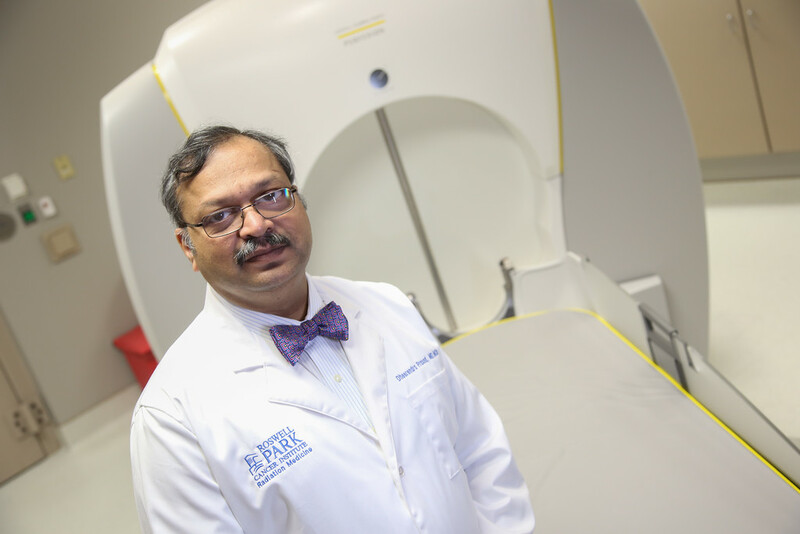 Dheerendra Prasad, MD M-CH, Professor of Neurosurgery and Radiation Oncology and Director of Roswell Park’s Gamma Knife Center, has treated more than 9,000 patients with Gamma Knife and serves as an onsite advisor to institutions around the world training to use Gamma Knife and is a pioneer in the use of the Icon. Gamma Knife provides a highly favorable approach to treating the brain compared to next-best methods such as conventional neurosurgery, standard whole-brain radiation therapy (WBRT) and Intensity Modulated Radiation Therapy (IMRT). At facilities and hospitals without Gamma Knife capability, patients with brain tumors and metastases would likely undergo WBRT. This approach involves radiating the brain in such a way that exposes all brain tissues to the potentially damaging effects of radiation. With Gamma Knife radiosurgery, only 0.5% of the brain is radiated, preserving significantly more healthy brain tissue and brain function down the road, improving both medical outcomes and quality of life for patients.